We are in the midst of one of the most heated Supreme Court confirmations in recent memory. In terms of pure public drama, Judge Brett Kavanaugh’s hearings—which will continue on Monday when he confronts allegations of his involvement in sexual assault while in high school—ranks behind only those of Clarence Thomas in 1991 and Robert Bork in 1987. From the start of the Kavanaugh hearing, Senate Democrats demanded that the Senate Judiciary Committee delay the proceedings until they could obtain, review, and get permission to publicly release more documents from Kavanaugh’s time working in the administration of George W. Bush in the early 2000s. 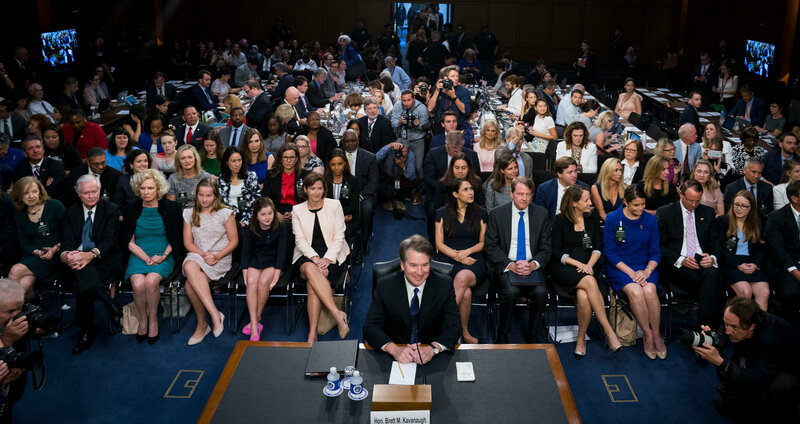 No sooner had they begun what would be a steady chorus of dissent throughout the hearing but members of the audience began their own protests, one after another standing to denounce the nominee and the hearings before Capitol Police escorted them out of the room and arrested them. This continued throughout the hearings, providing a steady stream of awkward interruptions to the proceedings. So are Supreme Court confirmation hearings worth keeping? To assess their value requires more that just identifying their most unsavory aspects and declaring them useless, of course. It requires an appraisal of their costs and their benefits. In the benefits column, there is the value of a public vetting of a nominee to a lifetime appointment to one of the most powerful offices in the land. Critics often counter that there are less public and less theatrical processes that would serve to better vet the nominees. But even if conceding this to be the case, defenders of public hearings insist that the nomination process provides a valuable moment when the American people have an opportunity to learn something about the often opaque Supreme Court—what it does, how it works, and the judges who serve on it. The Court’s legitimacy rests, ultimately, on public faith that the Court is serving its proper role, and confirmation hearings might offer an opportunity to bolster that faith. But here too critics push back, conceding that public interest in and understanding of the Court is important but asking whether what the people learn about the Court and the justices during confirmation hearings serve to strengthen or weaken public faith in the Court and its role in American society. So do confirmation hearings, and particularly sharply contested and controversial ones like the one we’re now witnessing, hurt the Court? In terms of public support, the Supreme Court stands above the other branches of government, and research suggests that this support is relatively secure. Nonetheless, there may be reason for concern that the kind of ideologically polarized, intensely partisan debates we’re seeing in confirmation hearings and surrounding them may be hurting the Court’s reputation among the American people. Some scholars have found that media coverage of the Court that focuses on the winners and losers of a given case (called “game frame” coverage) might undermine public support. Confirmation hearings, where media coverage is dominated by the language of partisanship and hyperbole, of winners and losers (see, for example, this Vox article, complete with “winner” and “loser” tallies), would thus seem to be a recipe for undermining the Court’s popular legitimacy. If the American people are to have a discussion of whether the circus of Supreme Court confirmation hearings are worth holding onto, we’ll need to consider what they give us and what they might be taking away from us. This post was written by ISCOTUS Fellow Zoe Arthurson-McColl, Chicago-Kent Class of 2020, and ISCOTUS Co-Director and Chicago-Kent Faculty Member Christopher W. Schmidt.